Dmitri Dell Young (born October 11, 1973), is a former Major League Baseball player. He played all or part of thirteen seasons in the Major Leagues as a left fielder, first baseman and designated hitter. He is the older brother of Delmon Young. Young attended Rio Mesa High School in Oxnard, California. As a senior, he batted .425 with 11 home runs, 31 RBI, 37 runs, and 8 doubles, and earned USA Today High School All-American honors. Young was a first round draft pick (number four overall) by the St. Louis Cardinals in the 1991 June amateur draft. In 1995, Young punched a fan who had been heckling him, which earned him a suspension from the Texas League. Finally, in 1996, he had a big year at Triple-A Louisville, batting .333, being chosen as a Triple-A All-Star first baseman and the St. Louis Cardinals Minor League Player of the Year. He was called up at the end of the season and played a few games with St. Louis in the majors. Young's first full season in Major League Baseball was with the Cardinals in 1997, in which he hit .258. After the season, he was traded to the Cincinnati Reds for Jeff Brantley. Eight days later, he was selected by the Tampa Bay Devil Rays in the expansion draft, then traded back to the Reds for Mike Kelly. While with the Reds, Young hit over .300 in each year (finishing second in doubles in 1998, and hitting 21 home runs in 2001). During those years, he played primarily the outfield and at first base. After the 2001 season, he was traded by the Reds to the Detroit Tigers for Luis Pineda and Juan Encarnacion. In 2003, he hit .297, with 29 home runs, and 7 triples (10th in the league). He was the Tigers' lone representative at the 2003 MLB All-Star Game, although he didn't make an appearance on the field or in the batter's box. On May 6, 2003, Young went 5-5 against the Baltimore Orioles hitting two homers and two triples, and a single. When he came up to bat in the ninth, he was a double short of the cycle. Instead, he hit his second triple of the night off Buddy Groom. "It crossed my mind, but since the game was close, my individual accomplishment took a back seat," Young said. "The run is the important thing." On April 4, 2005, Young joined George Bell and Tuffy Rhodes as the only players to hit three home runs on Opening Day in Detroit's 11-2 win over the visiting Kansas City Royals. Young and Tigers first baseman Miguel Cabrera are the only players to hit three home runs in one game at Comerica Park—one of the more statistically difficult home run stadiums. He was also known as "Da Meat Hook" and "The Big D" to Tigers fans. Young appeared at World Wrestling Entertainment (WWE)'s Survivor Series 2005 in an interview segment with Edge and Lita. Edge made fun of the Detroit Tigers, saying that they sucked, while Young cracked jokes at Edge concerning his failures on capturing a World Title. In 2006, Young went through a divorce, and was treated for alcohol and substance abuse and depression. He pleaded guilty to assault after an argument in Birmingham, Michigan. On May 17, 2006, the Detroit Free Press reported that Young faced a misdemeanor domestic violence charge. Young subsequently voluntarily spent 30 days in a rehabilitation facility, Promises Malibu, and three weeks working out with minor league teams. On June 13, 2006, Young failed to appear for a pretrial hearing on this matter and a bench warrant was issued for his arrest. Ten days later, he pleaded no contest to the domestic violence charges. On June 30, 2006, Young revealed that he had been battling several illnesses that resulted in him self-medicating with alcohol, which limited his physical fitness and kept him from appearing in all but a small fraction of Tigers games during the season. He made a statement to the press in which he asserted that he had been making progress overcoming it with the help of Alcoholics Anonymous, whose logo has been tattooed on his hand as a gesture of thanks. He returned to action on July 21, 2006, versus the Oakland Athletics, starting at designated hitter and ending the game with two hits and 2 RBI in the Tigers' 7–4 win. Before the game started, FSN Detroit aired a video of Young apologizing to the fans and saying how he will continue to struggle against alcohol and drugs for the rest of his life. On September 6, 2006, with less than a month to go in their American League Championship season, the Tigers gave Young his unconditional release in a move that surprised both teammates and fans alike. The day after Thanksgiving, an ambulance took him to a hospital, where he endured a three-day stay in the intensive care unit as his doctors diagnosed diabetes. Since then, Young has taken steps to get his diabetes in control and is encouraging others to do so. He has recently appeared on dLife to talk to people about how he has lived with diabetes. In late 2006, the Washington Nationals lost their first baseman Nick Johnson for nearly a year due to a broken leg. The following spring, the Nationals invited a number of first basemen to camp, including Young, who won the starting role. In his first game with the Nationals, on opening day, he hit 2 doubles. He went on to have a sizzling first half, reaching the All-Star break batting .340, third in the league, and he was selected to his second All-Star game—the Nationals' only representative. He singled in his only at-bat with two outs in the bottom of the ninth and scored on an Alfonso Soriano home run. Young received his Detroit Tigers 2006 American League Championship ring when the Tigers played the Nationals in an interleague series at RFK Stadium in June 2007. On July 4, Young hit a grand slam against the visiting Chicago Cubs. It was his sixth career grand slam. He finished the year batting .320, the highest of his career, and ninth in the National League. Towards the end of the month, Young signed a two-year, $10 million extension with a vesting option. Upon the season's close, Young won the Player's Choice National League Comeback Player of the Year award. 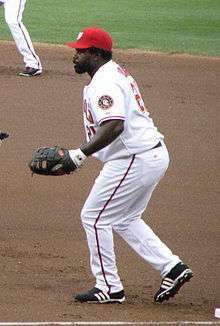 On March 29, 2008, the Nationals confirmed that Johnson would open the season as their starting first baseman over Young, although on June 24, 2008, the Nationals announced that Johnson would have season-ending wrist surgery and named Young as the starting first baseman. On September 17, Young was declared officially out for the season due to his diabetes. After spending the 2009 season in the minor leagues, Young officially announced his retirement on March 18, 2010. On the same day, he was introduced as the Vice President and Senior Advisor of Baseball Operations and Special Hitting and Fielding Instructor of the Oakland County Cruisers minor league baseball team. After the 2011 season, Young announced he was attempting a comeback, but was not signed by any team. Young began collecting baseball cards in 2000 when he and Reds teammate Danny Graves were offered $2,000 to appear at a card show. Young saw a Pete Rose rookie card and asked for it in lieu of the cash payment. In 2002, Tigers teammate Robert Fick introduced Young to Dave Bailey, a memorabilia collector, and the two eventually amassed perhaps the greatest collection of rookie cards in the world. He estimated that he spent $5 million of the $52 million he earned as a baseball player on his card collection. In 2010-11, Young co-hosted Card Corner Club Radio, a weekly sports card and collectibles show. In 2012, Young put nearly 500 of the mint condition rookie cards up for auction with plans to use the proceeds to open a baseball school and nonprofit foundation in Ventura County, California. The cards were auctioned individually and the collection ultimately fetched $2.4 million in total. His 1955 Topps Roberto Clemente card fetched the highest price, setting a post-World War II record by selling for $432,690. Overall, six different cards in the collection sold for six figures. Dmitri is currently the President of The Dmitri D. Young Foundation, Inc., a non-profit organization providing baseball and life choices camps for student athletes in Southern California, in particular in Ventura County and with this alma mater, Rio Mesa High School. His foundation is awaiting IRS section 501(c)(3) status. Dmitri's younger brother is Delmon Young, the first overall draft pick in the 2003 Major League Baseball Draft and runner-up for the 2007 American League Rookie of the Year Award. Delmon made his Major League debut on August 29, 2006, exactly ten years after his older brother. Young's sister, DeAnn, played college softball for the Oregon State Beavers. Dmitri and Delmon's father, Larry Young, from Mississippi, was one of the United States Navy's first African American F-14 fighter pilots. He later worked as a pilot for Delta Air Lines. ↑ Barry Svrluga (2007-07-08). "Embracing the Momentum: Nationals' Young Turns Personal Turmoil Into Triumph". Washington Post. p. E01. 1 2 Joe Lapointe (2007-06-28). "Young Hopes to Show Others How to Learn From Mistakes". New York Times. ↑ Bill Ladson (2007-07-28). "Nationals ink Young to two-year deal: Once viewed as trade bait, first baseman happy to stay in D.C.". MLB.com. ↑ Bill Ladson (2007-10-02). "Young named NL Comeback Player: First baseman takes advantage of second chance by Nats". 1 2 3 4 Henson, Steve (April 25, 2012). "Young's rookie obsession". Yahoo! Sports. Retrieved 29 June 2016. ↑ Duffy, Ty (12 May 2012). "Dmitri Young Had $5 Million Baseball Card Collection, is Selling it For Charity". The Big Lead. USA Today. Retrieved 29 June 2016. 1 2 Mueller, Rich (19 May 2012). "Dmitri Young Collection of PSA 10 Rookie Cards Brings Huge Money". Sports Collectors Daily. Retrieved 29 June 2016. ↑ "Dmitri Young Collection - Full Auction Results". 21 May 2012. Retrieved 29 June 2016. ↑ "DEANN YOUNG". Oregon State University. Retrieved 29 June 2016. ↑ "Meet Dmitri Young; See Former Big Leaguer's Big League Collection at Memory Lane's National Booth". www.psacard.com. July 23, 2010. Retrieved 29 June 2016. ↑ Harlan, Chico (June 20, 2008). "Twins Win Battle of Young Brothers". The Washington Post. Retrieved 29 June 2016. Wikimedia Commons has media related to Dmitri Young.